Welcome to my website! If you are looking for my sheet music, you can visit the 'Music Library', and if you are interested in lessons, please go to the 'Music lessons' page. You can also go to my 'Performances' page and find out where I am appearing. You will notice rather quickly that I have relocated to California; I came out here to be with my father, who died of mesothelioma on May 10th, 2008. Now I have made the decision to stay in California to be with my mother and to concentrate on performing. My mother sang to me when I was a baby; she was not formally trained but had a lovely voice and was a profound early influence. I also count my experiences with the chant in the Synagogue as a strong first musical impression. My only formal training as a child consisted of about three months of piano lessons at age eleven, with a nice young man named John. This was 1963, and John got drafted; so my lessons stopped. I kept fooling around and "making things up," but gave up reading music and wrote poetry instead. At 17 I decided to become the next Bob Dylan, so I borrowed my mother's old guitar and taught myself to play. I quit school and went hitch-hiking for several years; now I was Woody Guthrie. Gradually my musical ideas grew beyond what I could understand; I had discovered Varese, Schoenberg, Stravinsky and Bartok -- it was time to learn how to read and write music. At 22 I wandered into a local music store and started taking lessons with Keith Nelson, a kindly violist/choir director/music teacher and store owner. I lived in his store for several years; teaching guitar lessons, watching the counter, and studying piano, guitar, violin, harmony, and counterpoint. One day I met Steve Sinclair, a wonderful guitarist, who was a graduate student at a nearby college. He eventually twisted my arm into going back to school, but our local college seemed somewhat tame so I eventually found my way to Donald Erb and the Cleveland Institute of Music. After that, my education followed the more usual path and I was blessed with many fine teachers, as you can read below. I now write music for a wide variety of instruments and ensembles; I am especially fond of writing for orchestra, when my schedule allows me the time. I taught music to earn my way through college, and when I left Yale and came to Iowa I taught composition to undergraduate students. When I was sufficiently horrified by their lack of musical experience I began the Iowa High School Composers Project, in order to work with younger students BEFORE they got to college. Later, when I was sufficiently horrifed by THEIR lack of musical experience I took another step backwards and began working with even younger kids, on their instruments. Thus began Iowa Creative Music, and I now teach seven days a week to people of all ages and all levels of experience. Around 1996 I turned my attention to writing music for my students. I was tired of the usual methods and felt that there needed to be something more for beginners; music with real integrity, which would introduce them to contemporary music while systematically addressing their developmental needs. I have been writing for my students ever since, and the results are here in these web pages. 1999; Ph.D. in Composition; University of Iowa. Studies with Donald Martin Jenni, William Hibbard, and Kenneth Gaburo. 1987; M.Mus. in Composition; Yale School of Music. Studies with Martin Bresnick, Earle Brown, Louis Andriessen, and Leon Kirchner. 1985; B.Mus. in Composition; Cleveland Institute of Music. Studies with Donald Erb, Eugene O'Brien, and John Rinehart. 2001; Grants from the Iowa Arts Council and the McElroy Trust toward the commission of Columbus Suite, composed for the Columbus High School Band. 1993; Grants from the Iowa Arts Council and the McElroy Trust toward the commission of Intuit, a work composed for the Hudson High School Band. 1993; Grant from Meet the Composer, Inc. (through Arts Midwest) for workshops and lectures in conjunction with the premiere of Intuit. 1991; Pelzer Fellowship in Composition. the University of Iowa School of Music. 1991; Premiere at the 1991 International Trumpet Guild Conference in Baton Rouge, Louisiana of Fluvience, a work for multiple trumpets. 1990; Commission and premiere by the Iowa Center for New Music of Invoca/Responsories, a large-scale antiphonal work for 34 players. 1987; Helene Wurlitzer Foundation Grant. A two-month artist residency in Taos, New Mexico. 1987; University of Iowa Fellowship. Tuition and stipend for Doctoral studies. 1987; Kellogg Composition Award. Yale School of Music. 1985; Bradley-Keeler Memorial Scholarship. Yale School of Music. 1978; First Place, Southern California Music Teachers Composition Contest. 1992-Continuing; Iowa Creative Music (formerly the Iowa High School Composers Project) Founding Director. Private lessons and workshops for all ages in Composition, Music Theory, Piano, Guitar, Bass Guitar, Woodwinds, Brass Instruments, Percussion, Strings, and Voice. 1993-1995; The University of Iowa Arts/Education Outreach Program. ArtConnection Artist. Presenting workshops and performances in Composition, Improvisation, and Performance. 1988-1993; University of Iowa. Teaching courses in Composition and Fundamentals of Music, and directing Composers Workshop recitals. 1986-1987; Yale School of Music. Composition lessons and tutoring in Musicianship and Theory to graduate performance majors. 1984-1985; Cleveland Institute of Music Preparatory Division. Teaching Composition, Musicianship and Theory, and Electronic Music. 1983; Cleveland Institute of Music. Electronic Music for non-majors. 1979-1984; Cleveland Music School Settlement, West Side United Church of Christ Music Program, St. Luke's Music School, Koch School of Music. 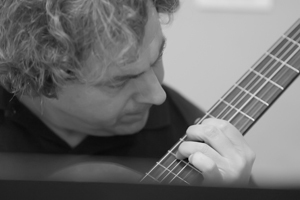 Musicianship and Theory, Composition, Piano, and Guitar.